tl;dr: Our last big update before release is here! tl;dr: Torment in the home stretch, new novellas released for backers, and new Type trailers to watch. tl;dr: The mystery publishing partner is Techland! Hello Exiles, Brian Fargo here. Updated Our Journal (40): In Good Company: Pillars of Eternity Launched! TL;DR: Gullet Stretch Goal Achieved! TL;DR: Gullet Stretch Goal extended to October 31; Gold Tide novella released; Monte Cook Games videos and more. Updated our Journal (34): Only 5 days for the Gullet! We couldn't decide which screenshot so we slapped them all together and animated it. 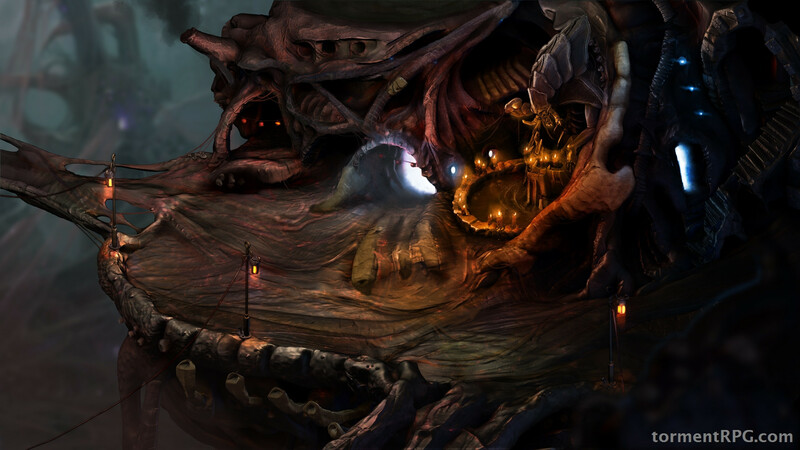 View the first glimpse of Torment: Tides of Numenera on our website! TL;DR: website re-launched – please confirm your pledge and any add-ons, Endless Battle lore, ask Torment developers. TL;DR: Info about Numenera books and the Wasteland 2 Beta; area design process; crafting system design; a design concept we’re calling Crises. TL;DR: Numenera books shipping; writers meet; crafting a screenshot; designing dialogue; programmer joins the team; new concept art by Chang Yuan. TL;DR: $4.5M Stretch Goal reached; design update; job opening for an experienced programmer; Numenera preorder ends May 31st; new concept by Andree Wallin. TL;DR: Updates, registering with us, managing pledges, add-ons, support, community. TL;DR: Thanks!, what's next, and the stronghold we didn't reach. TL;DR: Sagus Cliffs in Unity with new Mark Morgan music (video). New add-ons! Colin McComb answers some of your questions (video). TL;DR: Chris Avellone, New Add-ons, Sagus Cliffs Screenshot, Tony Evans describes our vision for combat (video), our Vision Document. TL;DR: Torment Sourcebook for Numenera Tabletop game, Pat Rothfuss Digital Comic and Companion, New Stretch Goals, Technology Test (video). TL;DR: A screenshot. Koy talks about environment art. TL;DR: Nathan Long tells a story (video). Five Fathoms deep. Dust and Water concept by Andree Wallin. Collaboration with Obsidian Entertainment. 2D pre-rendered graphics. TL;DR: New physical add-on options! Mur Lafferty talks about companions (video). Fourth Fathom achieved and Cult Dendra O’hur added! GOG.com digital download option. Party with us next Friday! TL;DR: Chris Avellone @ $3.5M. I hope you have all are having a great morning/day/evening/night! Hello! I hope you all have had/are having a great day.